"sweet . sour . spice"
Serve this gourmet spread with: Camembert, Brie, cream cheese and crackers, BBQ meats, sandwiches. wraps. dressings. Thai dipping sauce for chicken, beef, shrimp, egg rolls, wontons, spring rolls. 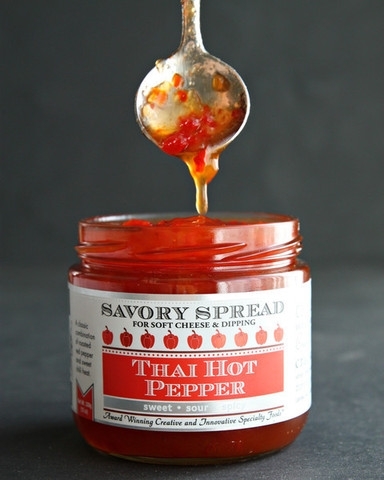 A sweet and sour savory spread made from roasted red peppers and our own “Super Hot Chilli Sambal” for spice. Served alongside crackers, cheese & bad t.v. Use as a sauce for any stir fry or Asian recipe. Spread on your favorite sandwich. The ultimate dipping sauce for egg rolls, chicken fingers and wontons! Combine with vinegar and oil for a thick dressing or wherever a sweet spice is what you need. There are no rules with this one, its up to you.
. Spread . Glaze . Dipping Sauce . Marinade . ✤ Dressing: Use straight from the jar or add a little water, soy sauce, lemon juice, oil and your favorite fresh herbs. Drizzle over salad and finish with sesame seeds. ✤ Stir fry for sweetness and spice. ✤ Glaze: Use as is or add lime juice and brush shrimp on the grill. Cover a cloved Christmas ham and return to the oven, basting regularly. ✤ Side: With crackers, cream cheese and bad tv!! Ingredients: Roasted Bell Pepper, Onion, Cane sugar, Cider vinegar, Lemon juice 100%, Wozz! Super Hot Chili Sambal (Thai chile, onion, bell peppers, lemon juice 100%, ginger, garlic, fish sauce(water anchovy sugar salt) Fruit pectin, sea salt.